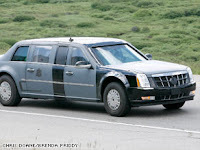 Here is a spyshot of President-elect Obama's limousine - it's a Cadillac that has 8 inch thick doors. While it doesn't quite resemble any one model, it does have the hand stitched seats and familar Cadillac logo. It hasn't been painted black yet, but it will by 1/20.